I am totally procrastinating at this point because I'm overwhelmed with packing. I am very eager to go; but I hit a wall with packing. And the problem is, when I am overwhelmed with packing, I over pack. So, I am stepping away from the crazy bin of things upstairs, and going to sit here and write a blog post! The good part is that the over packing seems to be all the gifts that we take for people. So, that means we'll have more room on the way home! Many of you will know this; but here is the story of the last few weeks. On February 8th, at 6pm, I received an email from our agency social worker to call her. However, as soon as I saw the email, I called her and her phone was dead. Around 6:45, she was finally able to get her phone charged and tell me that we had Travel Approval. We had a record 7 day TA! That's a miracle. The average is 10-21 days. Now, usually that means we are booking plane tickets within 24 hours. However, this was a Friday night. Friday night before Ch**se New Year. That means the US Consulate was closed. It re-opened very briefuly on the 14th and 15th; but that only allowed our request for a Consulate Appointment to be received. We were hoping to travel still on February 28th with a March 12th CA appt. On the 13th or 14th, I received a call that due to some logistical challenges we were requesting March 19th as our consulate and not March 12th and we may not get approval for that until Feb 19th or 20th. So, this was quickly becoming the shortest TA wait, and longest CA wait in history. I am going to tell y'all the flat out truth. I was devastated. I could not stop crying. I was frustrated, and even rather angry. I did not get it. That two weeks felt hard and horrible. Looking back, I also believe that the stress of waiting had just pushed me over the edge. I had not had a good cry about this in a long time. All the nerves and excitement just spilled out. After I understood that our agency was making this decision for our best interest and so that they could be fully available for us, and that they had a team going in on medical trip with doctor's who volunteer their time and understandably dictate when they can go, I was able to see the bigger picture. The agency needed all their translators and team available for us, and they couldn't do that if they were spread out all over the country at the orphanages. But, before I could grasp it all, I was a mess. And I didn't want to talk to anyone at the agency because I was so bummed and I just wanted to get on a plane yesterday. But, they were persistent in reaching out and allowing me to be emotional. I was even more impressed even though they aren't at all just putting on a show of being the most impressive agency in the US. 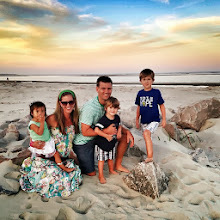 They are living out the Gospel and entering into the nitty gritty of adoptive families. As in typical-Jessica-fashion, after my big emotional drama, I was able to settle down and ask God to show me what he had for our family in the next few weeks. It quickly became very apparent that God had some things to do in my heart and Travis'. I wouldn't say that we were "benched"; but I would say that God pretty clearly let me know that I was not indeed ready to go. 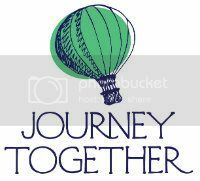 A group from our missional community was heading to the Empowered to Connect Conference in Orlando. Travis and I had hoped to go to this; but we thought we'd be traveling during this conference. It seemed too close to travel to leave our boys, too costly, etc. However, God had a plan for that, and I ended up getting to meet a friend who lives in Florida who let me stay with her (for free) and two of our awesome JTM families let me ride down and back with them (for free). So, after a $20 ticket, I was able to sit for 2 days listening to the ETC team share about connecting and doing the hard work for children who come from hard places. As soon as I arrived in Florida, I knew that was where I was supposed to be. 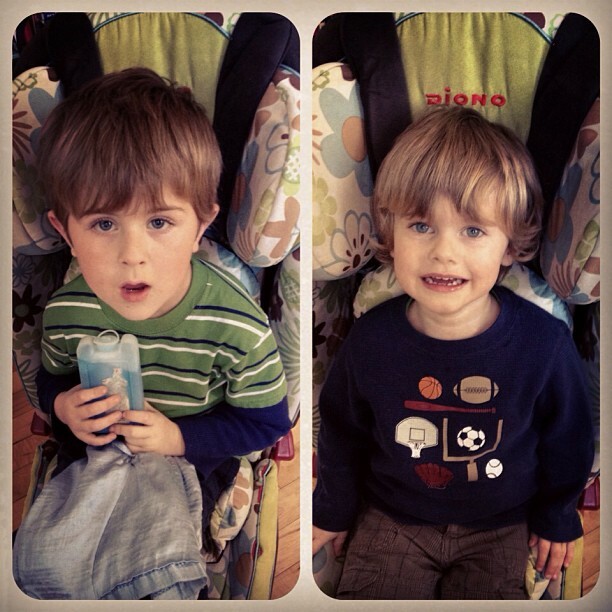 I knew God had some things to do in our hearts, and not just for Meili Joy; but for our boys, too. And again, time with our awesome community is invaluable. I think this is my 4th road trip with Sharon Lyon! I came home, and Travis had experienced his own God-encounter weekend, and not just because he kept the boys for 2 nights without me home! That's his story, so I won't tell it; but it was really great to come home and know that God had planned to work on both of our hearts that weekend even being a part and in different ways. So, on my 35th birthday, we received the call that we had our consulate appointment and could start booking our plane tickets! However, we were not sure at this time if we were going to be able to use the miles we were donated. Every time we went on line, all the dates required more miles than we had. We needed 55k or less for each leg of the flights in order to get all 3 of us home. Most of the options required 70k miles. After spending 10 hours on the phone with American Airlines, my agency, a travel agent (who quoted us $4k for the tickets if we couldn't get the miles to work), we were able to figure out a route from NYC to Hong Kong. However, we had to buy round trip tickets from CHS to NYC and then use the miles but we would have been buying tickets from BJ to GZ either way. We did have to leave on Thursday night instead of Friday; but we got the first flight out of HK (we can't leave GZ until 7pm on 3/20). So, we are flying up to NYC a night early to spend the night with my BFF, Abby, who just so happens to be Meili Joy's godmother and was adopted from S. Korea when she was a baby. 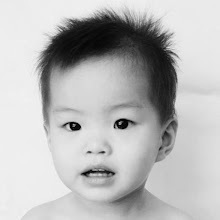 And we just so happen to clear customs in NYC on 3/21 in time to also let her meet Meili Joy. Can you so amazing? So very special. And, it just so happens that miles we are using at 55k each way are business class... and many of you know that I have some issues with my connective tissue, and this is a big deal. We are so very grateful. This has been an amazing gift for us. The family donating them would like to remain anonymous; and we are respecting that. But, we are so grateful. Back in 2005, I think I was a blogger. Today, well, I occasionally finally edit or post; or I just hit send and give up on spelling and grammar check. And I've been irritated at myself for missing so many fun things. I am using my FB & Instagram account as my journal for our milestones. However, here are some basic updates. Our Article 5 was picked up on January 30th. That means our final formal form was stamped and approved in Gu***hou and sent to the C****A in Bei%%g. I think that was a fancy step because it was hand delivered by over night courier. I also love that my paperwork was in the same envelope as our friends, the Rylands, and their paperwork for their two boys. So, once, the A5 and the rest of our paperwork was sent to the C***A in Beijing. We are just waiting on Travel Approval. Our agency will get this in the mail and call us. So, then what? Glad you asked. We will then scramble and call the family who is donating their bazillion frequent flyer miles and points and ask them if there are any conflict fly dates for the next 3-4 weeks. We'll probably put a flight on hold at that time. 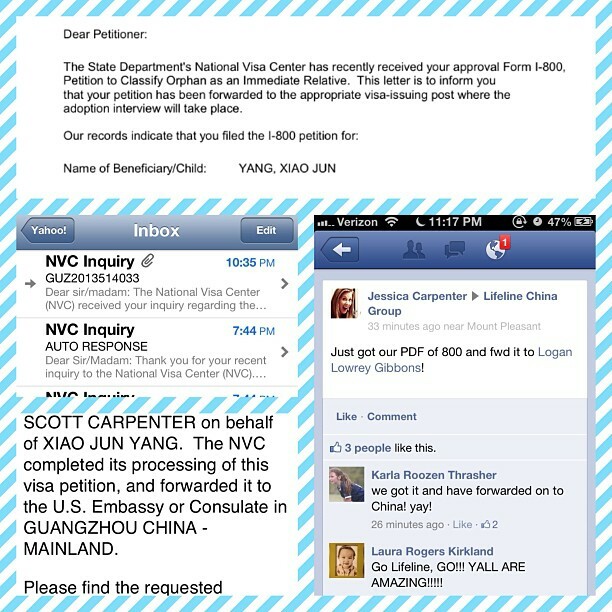 Then we'll quickly request a Consulate Appointment with the Consulate in Gua***ou. They'll approve our CA appointment (takes about 24 hours). We'll call back to the family giving us the miles; book our flight; and cry and scream. In the middle of that, I will send a flurry of text messages and probably half of Mount Pleasant all the way to the Battery will hear me. They might even think it's another Revolution. I'd also like you to know that my hair stylist and friend, Heather, will be getting one of those first text messages. What?! Vanity you say? After all this fundraising, and pleading for the cause of the orphan, etc, I'm going to get my hair done. You bet your bottom dollar. I am not about to meet my daughter with 80s prom hair and roots 4" long. Priorities, People! Then, we'll get on the phone to schedule the rest of our trip/coordinating flights from BJ to GZ and all that jazz. Then, I will start freaking out over all the things I should've have been doing when I was hitting "refresh" on my phone and email. And I'll make my Mom & Dad a 16 page list of notes on the boys. And I'll sing our final Power of Attorney, Will, etc. Pack our bags, finish shopping, and hop a plane with my husband! So, we are only on day 7 of our wait. And everyday, I have to admit, I'm obsessively watching all 4 of my Ch*** FB Groups. Every time someone posts a TA, I study the agency name, and how long they waited. Today marks Day 7 for us. Today is the first day that we could MAYBE get a call. I know this because our agency got a batch of TAs last Friday. The catch is that Ch(((se New Year is next week. So the C****A is closed til the 18th. And then the Consulate is closed on the 18th because they celebrate US holidays. Seriously, that is the gig to have? You celebrate in-country holidays & the country you represent. Genius! So, back to what I was saying. We could get our TA as late as Feb 12th if they mail them Feb 8th (and if we are in that batch). And then the Consulate would be open the 13th -15th (Ch**a) days, so really only the 14th & 15th here (8 hours a head over there, I think). So, that's what I'm totally NOT obsessing over. Sigh. 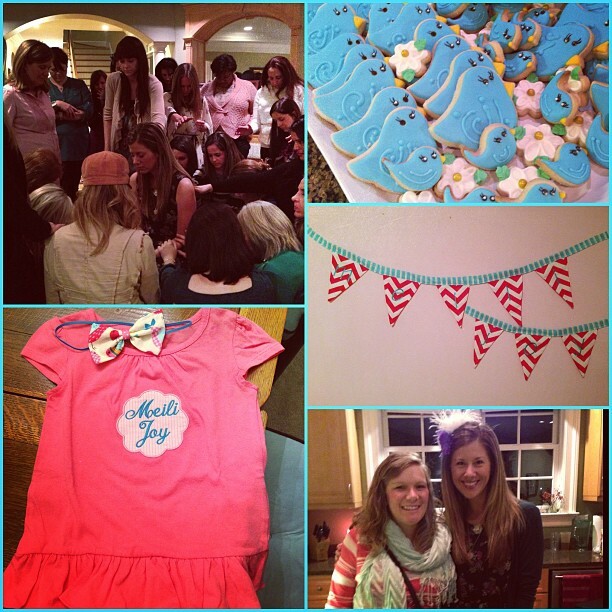 In other news, we had an amazing shower for Meili Joy on Monday night at my Mom's house. 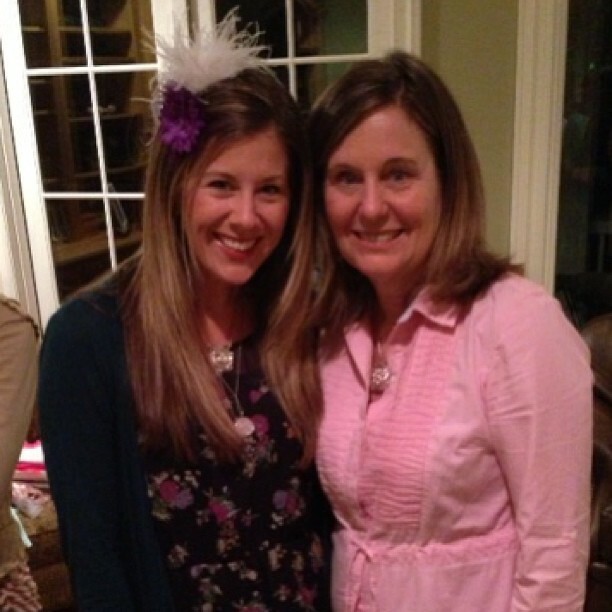 She preached a little adoption theology and hosted with some of my best girls. I appreciated every person who was there and who has walked this journey with us. We wrote names on the blocks from Meili Joy's block party, and we wrote notes for CNYear on special envelopes (Mrs. Gregory, you are brilliant!). Cherry blossoms were everywhere! My first pink shower! 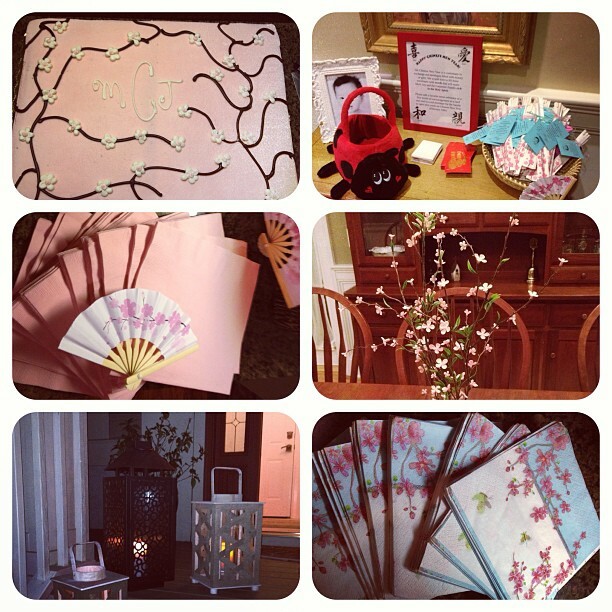 All of our gifts for her are so special. 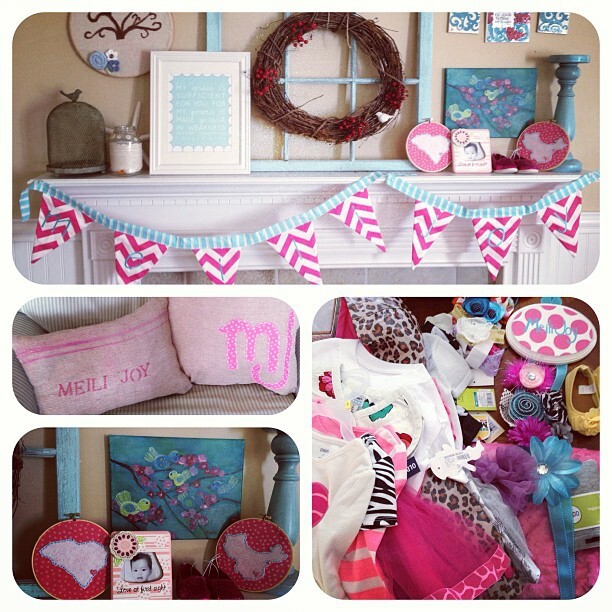 Adorable clothes, bows, leggings, shoes, dresses and art work and custom clothing, just so very special! And a special skinny car seat for her (since she's only 22 lbs) that we can fit 3 across our backseat! My favorite moments was to sit in the middle of these wonderful women, I honestly almost fell over, just from the emotion of all the women who prayed for me, Travis, our family, my parents as they keep the boys, MJ's TOF heart condition, etc. I am carrying those prayers of the Saints with me. Thank you, ALL! 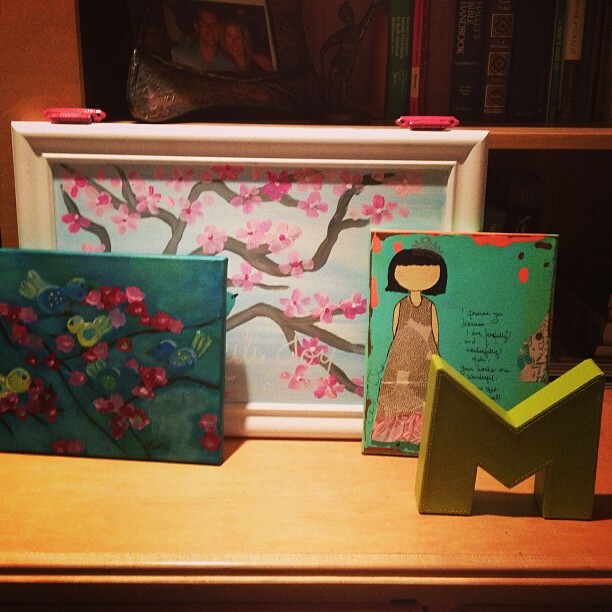 Your Thank you cards are coming w/ our Meili Joy is home announcements! Um, yes, it'll be our 2011/2012 Christmas Card/Thank you Card/ Announcement Card! I know that my Father loves me even more than I love our Meili Joy. And I know he knows every detail. I can't explain, though, how absolutely difficult this is to just wait and know we can go at anytime. I totally am claiming 9 month adoption/preggo hormones! I just want to get to my Baby. Again, totally a paradox. I believe that God knows exactly when we'll go and has drawn out each step, and I'm also letting myself be super eager to leave NOW! In the midst of this, it's been so much fun to soak up our boys. Stand and watch them. Stare at our family of 4. Big transition ahead. We've been an "all boy" family for 6 years! Every time a family grows, there are changes, ebbing and flow. But, the wait.is.really.painful. Almost physically. I had no idea that it would hurt this much. The anticipation. Our little girl leaving her foster family. Thinking of them and the empty home they will return to. Oh, Jesus, please let them come to the orphanage the day we visit. We hope they come. We want to hug them. It'll hurt, oh, boy, will it hurt. And our baby girl might not want us when she sees them; but, Jesus knows we hope to see them! I also have not blogged about this; but I absolutely can not stop thinking about our I800 approval that says "Petition to classify orphan as immediate relative". Oh, wow! Seriously! Do you not see the parallel? "Petition" granted- Jesus on the Cross- "to classify orphan"- oh, y'all know by now we were slaves, orphans, lost, etc! Then "as immediate relative". Yup. To the KING! Y'all to the King of the Universe! Not the President of America or anywhere else. THE King. My Jesus. Oh, it's so overwhelming! You see what I'm doing here. Preaching the gospel to myself. Preaching it so I can hold on and not grow wear or sad or tired. That's our Hope. That's our Joy. We are coming. Your brothers are talking about your daily. Austin said he isn't even going to miss us. Your brother, Justus, says "pray" every night before we go to bed and says "Mei-Joy home". Your Daddy is working his tail off, so he can take time off and orders can keep rolling in; and your Mom. Well, she's a hot mess obsessed with holding her cell phone for the call and refreshing her internet feed for a hint of a "TA" batch coming. And she's sad for you foster family, and she's sad for you. And she knows you may not think she's that great at first. Hey, your brothers don't always think I'm a rockstar either! We are fully embracing our absolutely crazy-selves and just going to love you with full hearts. They say "Go Big, or Go Home!" Yup, that's what we are doing! And we are so excited. And we may be a little scarey at first; but we love Jesus and we know that He'll shine through. And in our imperfection and weakness, He'll be our strength, hope and love as you join us!